Color lovers, rejoice! 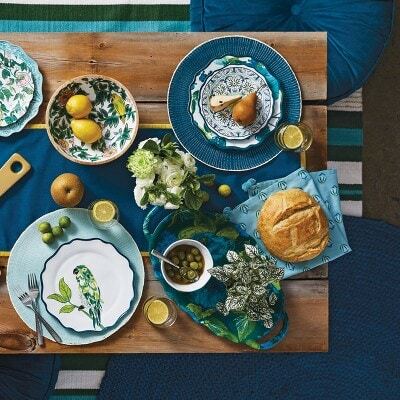 The new Opalhouse line at Target is full of high-quality, colorful home decor and accents at affordable prices. In this post, I share my full review of the Opalhouse items I have purchased for myself, as well as my thoughts on the entire collection. 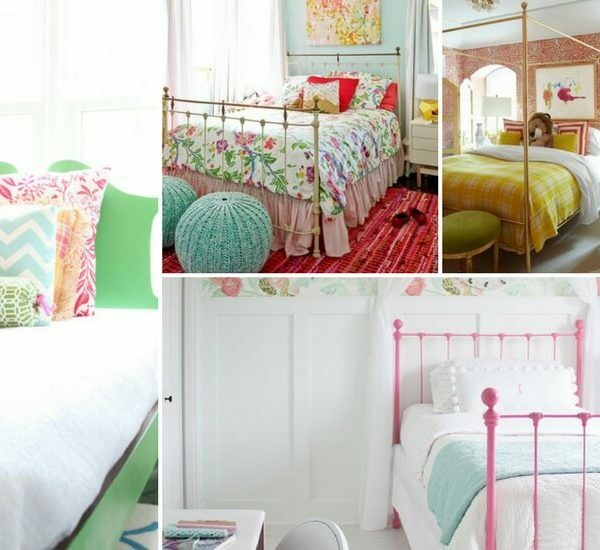 It's no surprise that I love colorful home decor. Sadly, it often comes at a pretty hefty price. 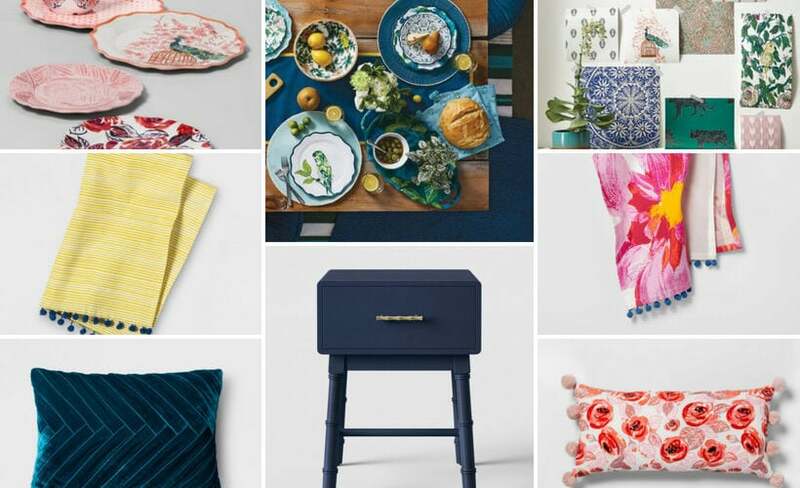 I mean, I would love nothing more than to fill my house with colorful furniture and home accents from Anthropologie's home line or West Elm, but my wallet would revolt. So when I first learned about the colorful Opalhouse line that was recently released at Target, I was hopeful, but skeptical. 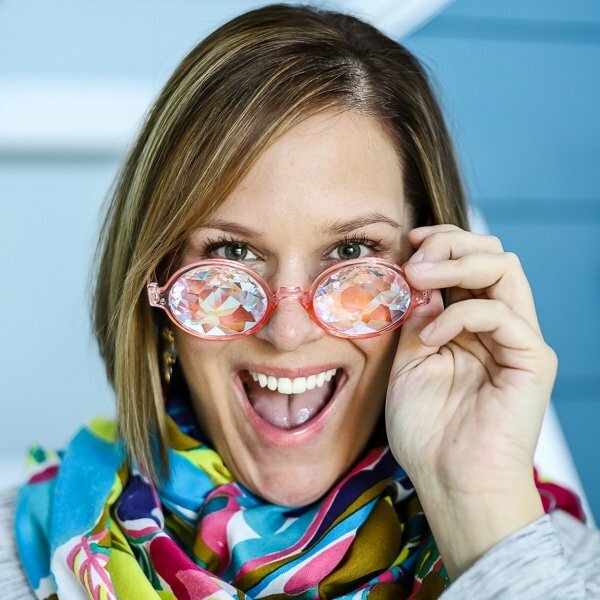 The Opalhouse collection is full of around 1,300 colorful and eclectic pieces. And get this… most of the items are under $30. That's a big part of why I was skeptical over what the quality would be like. 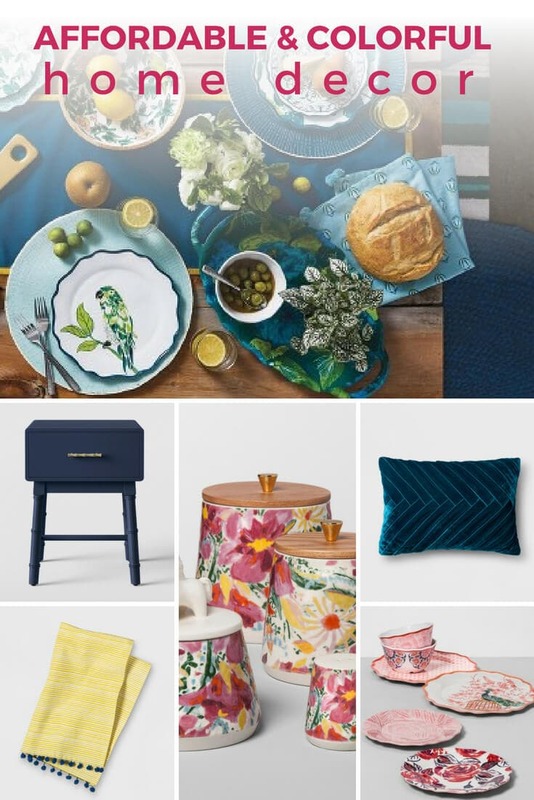 But I have to tell you, I have inspected the Opalhouse line many times at Target (because YES, I am one of “those” women whose idea of fun is browsing the home section at Target) and I have been impressed every time. And more recently, I finally purchased myself a haul of stuff from the Opalhouse line and am even more impressed with the quality now that I have it at home and am living with it. 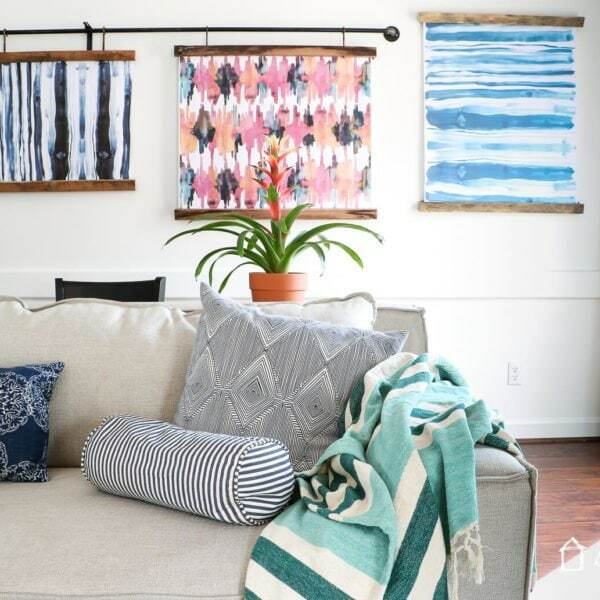 So let's dive in and take a closer look at the Opalhouse home selection. I'll start by reviewing the items I personally own already. Lumbar Floral Pom Pom Pillow– I purchased 2 of these pillows in the orange/pink color for our master bedroom and am really impressed with them. 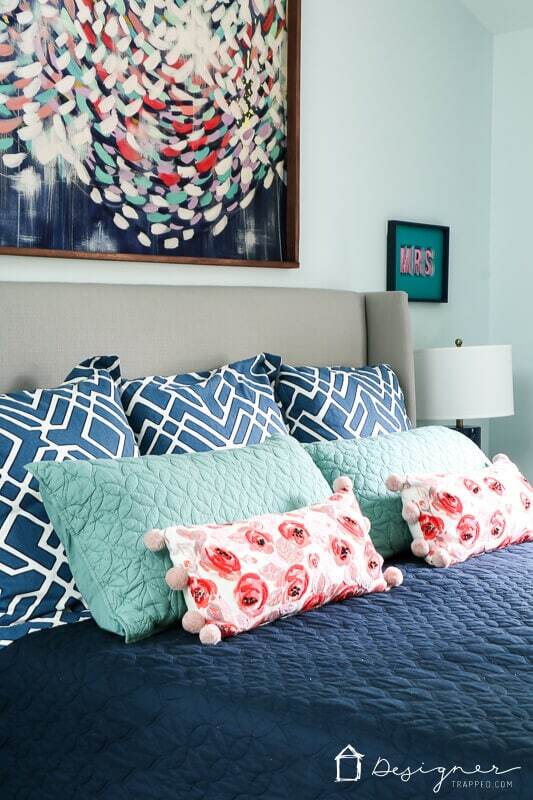 I mean, obviously the color and pattern are totally my jam, but the pillows really are a solid quality. They are firmly stuffed and don't at all feel like they are half-full of sub-par filling. I have purchased many, many throw pillows from Target and these are definitely a higher quality than most. You can see them in our bedroom below. 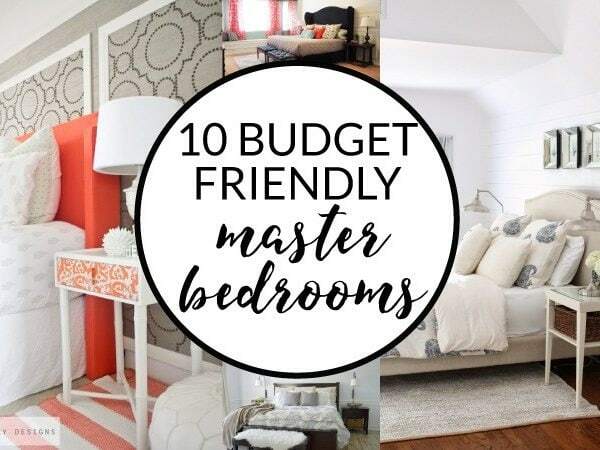 Click here to see a full tour of our master bedroom. 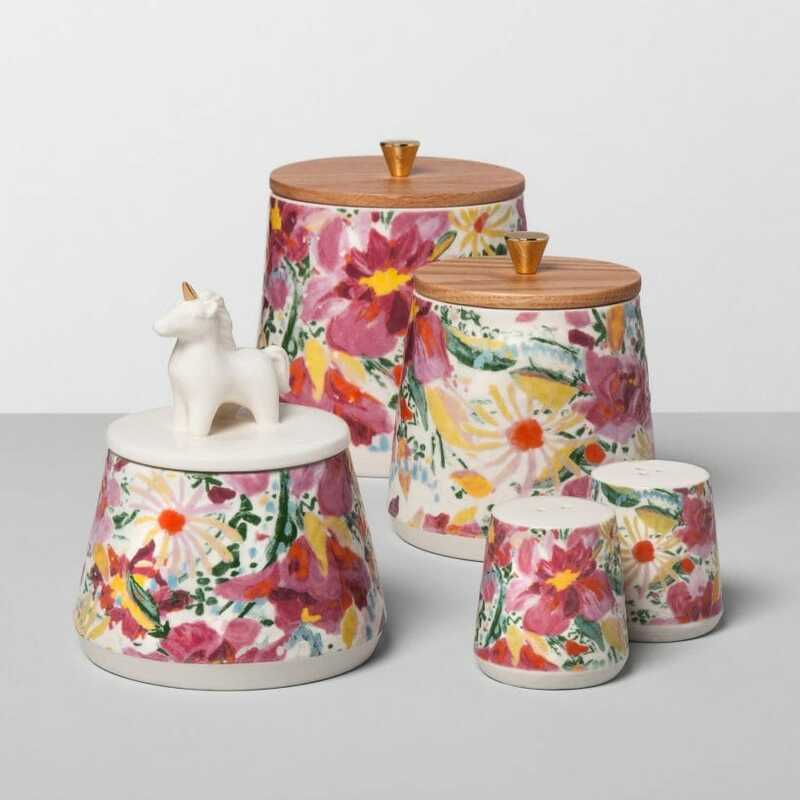 Floral Stoneware Canisters– I'm a little bit embarrassed to admit to you that I purchased FIVE of these canisters. We are actively using 3 of them in our kitchen. But the other 2? I really have no idea where we will use them. Maybe in our master bathroom after we renovate it? I don't know. But I loved them so much I bought every last one that our store had in stock and I don't regret it. 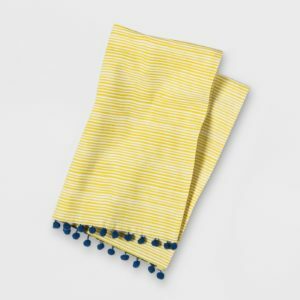 They look like something you would find in Anthropologie, but for a fraction of the price. I don't regret it one bit. 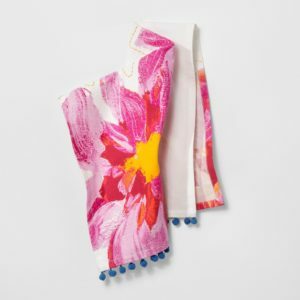 Opalhouse Dish Towels– I bought about 10 dish towels, in various patterns. I'm not actually going to use them in our kitchen. That would be too easy. No, I plan to make throw pillows with them. Now, I will tell you that the quality of these dish towels is really nothing special. But the colors and patterns are fantastic and the price is even better. 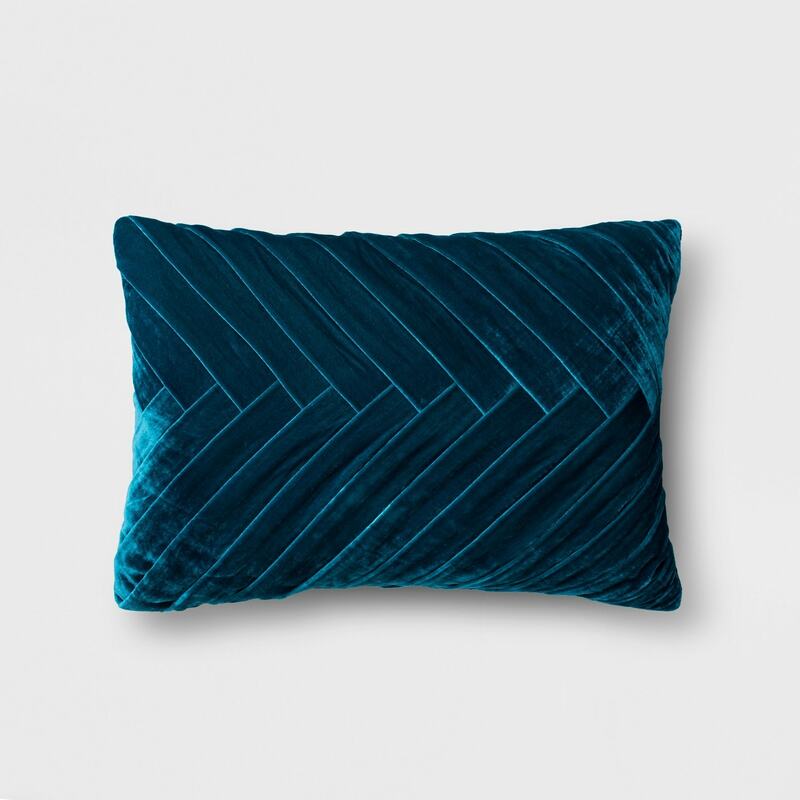 Pleated Velvet Pillow– I bought this beauty for our new family room couch for which we are anxiously awaiting delivery. This pillow looks and feels like it cost a whole lot more than it did. This is probably the Opalhouse item I am most impressed with so far. Those are the only Opalhouse items that I have purchased so far. But here are some other things that I have my eye on and have checked out multiple times in the store. 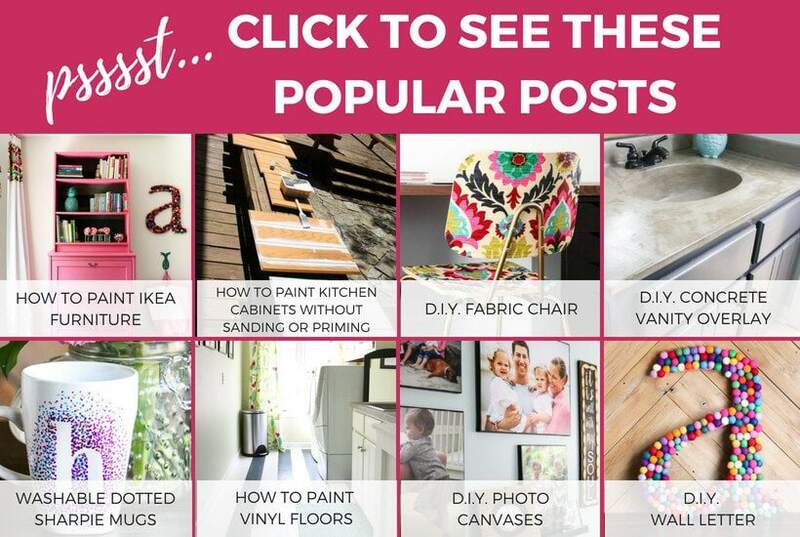 Removable Wallpaper– If you are a regular reader, you know I recently overcame my fear of committing to wallpaper because I discovered the magic of removable wallpaper and used it in our linen closet makeover. 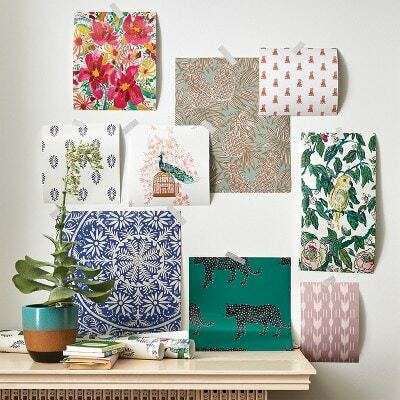 Well, Opalhouse has some GORGEOUS removable wallpaper options that I am completely enamored with. I'm considering using one of them in our guest bedroom. You'll have to wait to see which one :) I'm definitely going to try to learn more about the quality of it before I dive in. 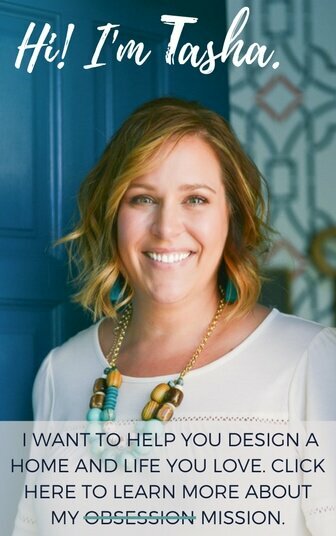 I know that the removable wallpaper I used for our linen closet was exceptional quality, and I don't want to use something that is lesser quality that creases easily. I'll keep you posted. Opalhouse Melamine Dishes– We've been talking about switching all of our dinnerware to indestructible melamine for a while now. We aren't a fancy family, and I just want some dishes that won't chip… EVER. I would have already bought an entire set from the Opalhouse line because I love everything about it. But Joe is a “plain white” kind of dishes guy. So, whether we snap these up remains to be seen. But the quality and price is fantastic and the colors and patterns can't be beat. 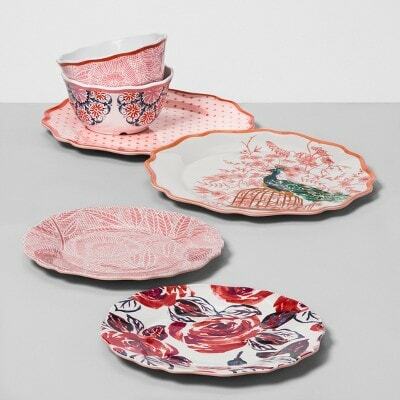 So if you are in the market for melamine dishes for indoors or outdoors, you won't want to miss these. 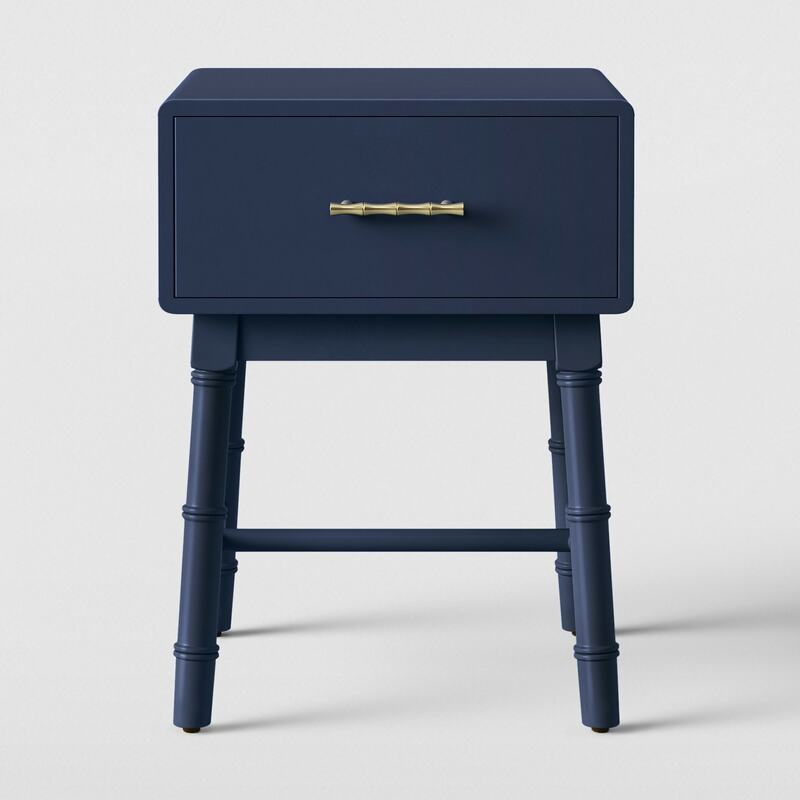 Painted Accent Table– I really wish I was in the market for a bedside table because I am head over heels in love with the details on this beauty. Sadly, I have absolutely no where that I need a piece like this. So instead, I'm telling you about it, because I REALLY want someone to take advantage of this gorgeous piece. It looks so high-end, but the price is a total bargain. Well, there you have it. If I haven't made it clear enough already, I am a BIG FAN of the Opalhouse line. 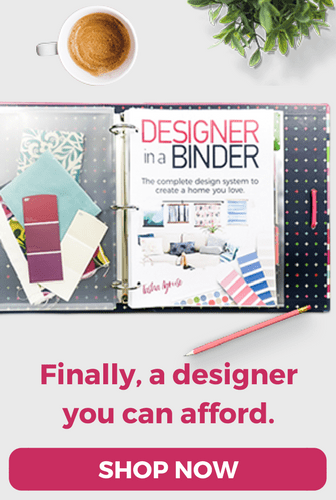 It's an affordable option for color lovers that can't regularly splurge on similar items at more expensive retailers. I hope it sticks around for a long time!